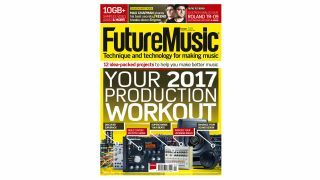 Kickstart your music making in 2017 with FM's Production Workout. Our latest cover feature has 20+ pages packed with fresh ideas, projects and tips. From brushing up on music theory to getting to grips with Eurorack, we're here to help you try exciting new things in the studio for the new year. Sci-Fi FX - Hits and sounds designed to add a touch of science fi ction excitement to your tracks and productions. Total Transitions - Risers, downers and transition effects of all shapes and sizes, perfect for creating seamless arrangements. Access the FM sample archive: Download the 'Archive' packs and get over 8GB of loops, hits and instruments from our back catalogue of high-quality and royalty-free samples. From vintage synths and drum machines to esoteric instruments and FX - think of it as our best of. All the samples you need to create great music!